College Admission is a critical decision in everyone's life. Before choosing a right college for admission, students need to understand various details about the college, approval status of the college/courses, fees structure, hostel facility, lab facility, campus placement etc. Choosing the right course and right college is a major turning point in your next phase of life. So, don't do it with what you know or what your friends, relative or neighbors say. Seek for a qualified counselling expert and get all the details. Based on our study, there are around 30,000+ colleges, 1400 unique degrees, 172 career fields and more than 340 entrance exams at national and state level. Our Research team came out with various books and you can get it from our EduStore. Understanding all the college, courses, future career by any student, parents or college professor is not practically possible. We need a specialized expert who should have done three to five years research on colleges, courses, Indian Education Systems, Entrance Exams, Education Loan, Scholarship etc. to give the right direction. Guidance on How to attend State level counselling or entrance exams. Understand students education and career interest, study their natural talents, expected marks and cut-off marks, financial background and recommend suitable course and colleges. Choose and recommend the suitable college and course from around 30,000+ colleges across the country, 1400 courses, 172 career disciplines and 340 entrance exams. Address any difference between parents interest and students interest. College details and cut-off marks trend of past years. "What To Study? - Chart"
There are about 172 career Disciplines, More than 4300 courses, around 30000 different types of colleges in India. Any individual who wants to give career guidance advice to others requires two to three years detailed study and experience about Indian Education System. Choosing an education and career should be aligned with your interest, talents, ability and your future. For any person, choosing an Education , Career and Marriage are important decisions of their life. Once we take a direction it is very hard to change. We can't take any risk by choosing some course based on what we know, or what our friends, relatives, parents and neighbors say. What they know may be based on their own experience, incomplete, incorrect and outdated information. Anyone who is studying in college and looking for their next step towards career can take this counseling. There are about 172 career Disciplines in India and students should choose the right post graduation and other available options after their current undergraduate course. Students may want to know the entrance and other process to choose their higher education. Students may have a question whether to choose a higher education or job, Students may have a question over choosing a regular post graduation course or distance education. Students may have confusion whether to choose the post graduation course in India or abroad. Anyone who needs clear direction for their next step can take up this counseling. Anyone who is studying in college and looking for higher education abroad can choose this counseling. If you are looking for guidance to study any specific course and procedure to study in UK, USA, Australia, New Zealand, Canada, Germany, Singapore, Russia, Georgia and Malaysia or any other country you can choose this counseling. For any student we only provide information and guidance and we don't directly work as an agent for any country. We will not be supporting any visa or any kind of process other than giving details. Institutions who are interested in corporate tie-up for Education and Career Guidance Counselling for their students can avail of this package. We have a professional team and process to deliver this package to our customers. We are already working with various CBSE, Matriculation and International Schools, Colleges to offer customised counselling solutions. 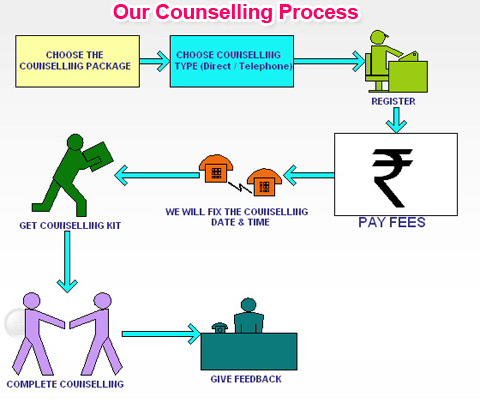 We have been doing direct counselling for more than 4 years. Many institutions have signed up for annual as well as need based counselling for their students.